Rated 3 out of 5 by Howard Olsen from Great Design - Needs An Update To Increase USB Pow I've had this Charger / Power Bar for a few years now and it is a terrific design, it travels well and it used to work... BUT ... Now that more devices are coming out with USB C and high capacity fast charge batteries it doesnt work anymore. I just came back from a 2 week trip across africa where I travelled with a PC, Projector, Tablet and Phone. In the conference rooms, it was great for using 1 plug adapter into the Belkin unit and then plugging the PC and Projector into the N. American plugs. But the problem is with USB Charging. With a combined 2.4Amps, I could only charge one device at a time. Both the phone and the tablet have high capacity fast charge batteries and whenever I tried to charge both at the same time I got a "Slow Charge" error. This was a real problem when travelling for this length of time. 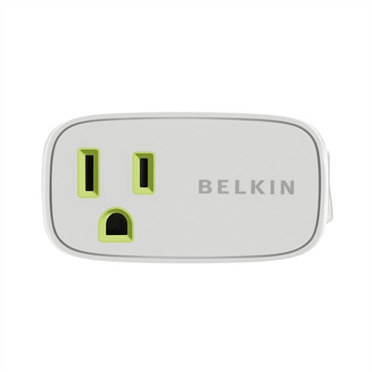 Belkin, It should be an easy update to increase the wattage and the amperage with a Smart IC chip... That would take this great design and bring it back to current but as it stands now, I will not travell with it anymore and will find an alternative. Rated 5 out of 5 by MickySFV from Well you’re going to carry a charger anyways..... I grabbed this because I’m always on the go and more often than not, have multiple high drain devices that I need to power throughout my day, the added benefit of being able to charge my iPhone X and Apple Watch 3 just makes this the perfect on the go charger I’ve seen!!! 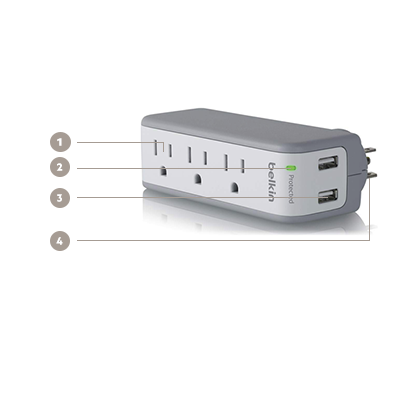 Rated 1 out of 5 by Ken1211 from Initial Review - Rotation The product arrived today - Surge Protector Model no. BST300bg. I have not used it yet, but I did try the prong rotation; which is why I ought it. There were no instructions packaged with the product. I saw the rotation icon next to a white button-looking piece, so I pushed. I could not budge the prongs. 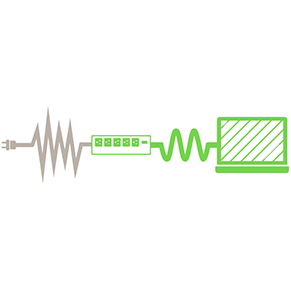 So I went to the Belkin web site. Through reading customer reviews, my guess was confirmed that the white thing is the prong lock. I also read reviews stating other folks also had problems rotating the prongs. Following one reviewers tactic, I used a blunt tool to exert more pressure on the button. Well, the button went down and the prongs rotated. As a "bonus", the button stayed down in a lopsided sort of way, but now, I can rotate the prongs at will. I plan to update this review after used the device in its intended purpose. 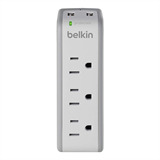 Rated 5 out of 5 by wordplanet from Works well - Great in tight spaces! I bought this years ago and find it's a huge help when I travel or even when I want to plug in my laptop anywhere around my house. The best was after we lost power with Hurricane Sandy and I went to a coffee shop in another town to power my laptop and phone. 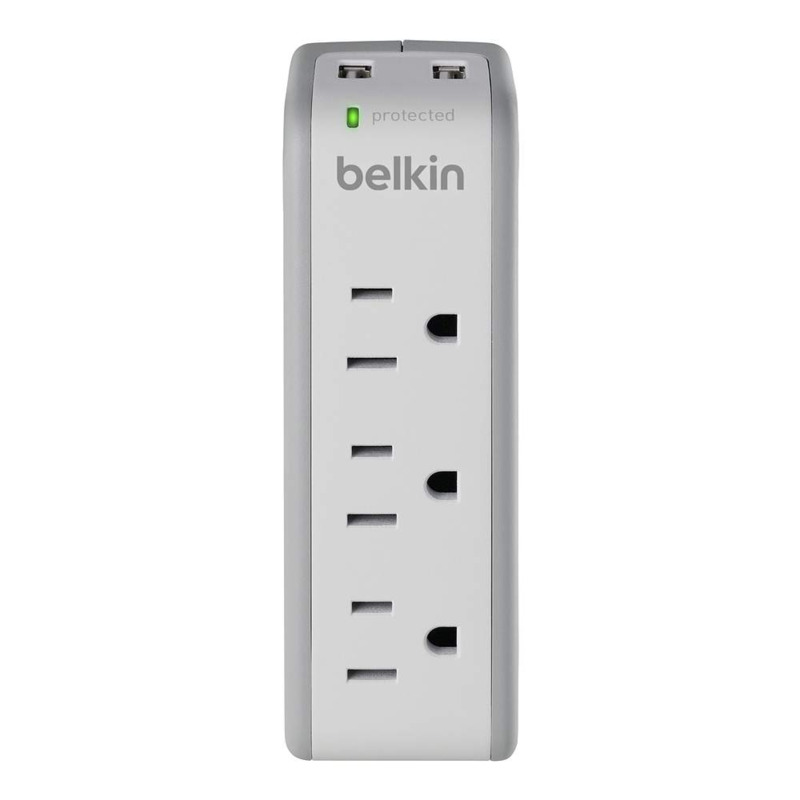 All the plugs were taken but I had this little Belkin with me - so those using a nearby outlet were happy to share it and one woman I ran into later said she went out and bought herself one. Great little travel companion even close to home. I wish they made a similar one for overseas. It's never been tested in a surge situation but it gives me peace of mind. 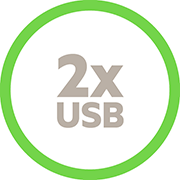 I have an older version so it is slow if I have both my phone and tablet plugged into the USB ports, so I usually plug one into the plug instead. Rated 2 out of 5 by valerie57 from Rotating button doesn't work The 360-degrees rotating plug doesn't rotate on mine. I pushed the unlocking button but it doesn't budge and is stuck in one position. Other than that it works fine. Rated 3 out of 5 by mperk720 from Good, Not Great;; Only Works With 12 This works well as a small travel-sized plug extender. 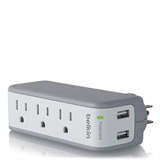 The drawback is you can't use it outside the U.S. or anywhere that uses higher voltage electricity. All of my plug-in chargers can take up to 240 volts, but this item is only good for 120 volts.You won't see that on Belkin's site or on Amazon (where I bought mine) If I had realized this device can only handle 120 volts I would not have bought it. Wanted something that is more versatile and can be used for international travel. The other thing to know is that turning the plug portion to match up with the wall outlet is difficult and takes a lot of strength. If you have weak hands, this might not be for you.